HEALTHY HORSE is the third in the EASY HORSE series. It is compiled of expert knowledge shared by professionals involved in various aspects of the equine industry, and covers some of the most important areas which form part of horsemanship, such as feeding, shoeing etc.. These aspects may not be the most exciting aspects of the horse industry, but the knowledge shared in this e-book may save you much pain and prevent and solve some of your most serious problems. The truth about bran. We have a total misconception about bran. Learn the shocking truth. When to feed for exercise and competition. Causes, anatomy and treatment of colic. Gastric ulcers (did you know that most stabled horses have it?). The reason why large quantities of high quality fibre is essential. 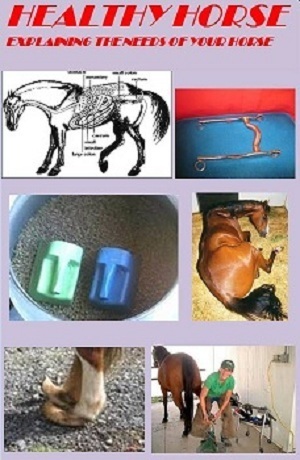 Causes, anatomy and treatment of laminitis. Protien requirements of a horse. The instant treatment of quarter cracks is discussed and explained on this video – essential for any horseman. The principles on which to select a bit. Novices so often make uninformed choices. The technical aspects, such as bit width. Squareness on the mouth bars. If this is not right, it can have a major influence on the mouth. The effect of various ports on the severity of the bit. Other factors which influence the severity of the bit. The sweet iron effect on salivation. Various bits and its uses, demonstrated with photos. Healthy Horse will continuously be upgraded, and new information is being expected. However, a lot of little known, but critical information already appears on these 86 pages, to provide you with essential background knowledge. I trust that this e-book will help to fill this crucial gap in your life and the lives of your horses.